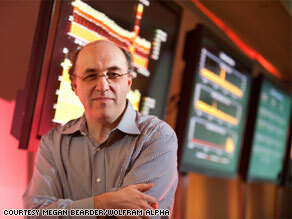 Wolfram Alpha, the much-anticipated online calculator and search engine, is set to launch for the public today at 4 p.m. ET. The site looks like a search engine but acts more like a giant calculator. It can crunch mathematical formulas, compare statistics and build charts based on online data that's curated by a team of scientists and mathematicians. Some see Alpha as a major advancement in the search world, primarily because it does something Google doesn't: it creates new information, rather than just searching for what's already available online. Check out this previous post for more information and for a CNN review of the site's pre-launch version. And here's a recent CNN story about how this news fits into changes in the world of the search more generally. Several search engines are trying to supplement Google, rather than compete with the search king, which captures more than 60 percent of the market. Of course, Google has some search news of its own, too, which appeared to be timed with news media buzz about Alpha. When Alpha launches, take a look and let me know what you think. Which searches worked? Which didn't? Do you think the site is a useful supplement to major search engines like Google, Yahoo! and Ask? Is it being hyped? What is the meaning of life, the universe and everything? The answers were interesting and entertaining. Many of my questions didn't get good answers (what is your favorite color) but that's understandable. If I keep my questions to mathematical ones (26! – 26 factorial or sin of 45 degrees) the answers are unambiguous. I've been feeding it all sorts of different questions and the results are mixed. However, I can see a usefulness of this new search engine especially if my questions are mathematical or scientfic in nature. The pages look terrible on IE 6. Why would anyone use IE6? IE 6 is dead ... who cares. Dude! You're still using IE6? Serves you right!! Question is: Will someone make an iPhone App for this site? Jim, every thing looks terrible on IE6 because it's a technology disaster. Upgrade to IE7 or 8 already so developers can stop wasting time supporting obsolete and buggy browsers. Why are you still using IE6? You're now officially 2 versions behind. The problem lies with your browser, not the site. I submitted "number of times bush lied" and it said it wasn't sure what to do with the input. After going tru some usage examples from WolframAlpha website. I tested if it could handle multiple syntax, Intuitively i entered "b + b =4, a + a =2, a + b =?" and to my delight, it understood the problem and answered correctly that a + b = 3. "Number of horns on a unicorn?" I was looking forward to seeing what Alpha could do. I'm sorry to say, I'm not impressed – it's pretty weak. "Wolfram|Alpha isn't sure what to do with your input"
Try "web browser usage statistics". You get that line, and a suggestion that you may want to search "web browser". Click okay, and it says it's software. Demographic data for Denver was 5 years old. Ballpark figure at best. "How many US Senators are there?" Returns: "Development of this topic is under investigation..."
Like I said, weak. So far, not much more than an out-of-date database, not any fancy algorithms doing... anything. Still, it's only JUST released. It's going to need to grow in capability, and FAST, to make it anything more than a flash in the pan. What the publicity for it has already shown, is that there is an interest in doing more than Google. That may be the point. Perhaps Alpha is trying to get noticed just enough for a Google to swoop in and buy them up. That's not a remedy for an engine's success, though it might be for the owners. The thing works like crap with simple searches. Not for mainstream use. It spit out facts about Hudson, Ohio but could answer population trend / time / famous people questions... there seems to be one location format and that is all it can handle. It can give you distance vand flight time between any two cities, but no links to dig deeper than single format of results. Uhhh...if the pages look terrible on IE, try using a real browser instead of sucking MicroSlop's Kool-Aid...or do you work for MicroSlop?? I'll bet Wolfram doesn't use Windoze...or other MS prods for that matter. Agreed with you Jim, the page looked chaotic..
Wolfram Alpha's fantastic! I love the feature that allows you to compare chemical elements and whatnot. Very helpful indeed. site looks horrible on explorer 6. a lot of the searches did not find any results. Oh My I am loving this web-browser. This is a solid example of a personalization of web. So many people on the web everyone has a different need in the web. This browser is especially for the people trying to solve a equation or looking for a formula that contains sine or cosine or tan or some other mathematics formula. The way information is displayed is very helpful if u know what u are looking for. Well overall this is NO COMPETITION with Google, we have to just look at this in a different perspective. App lets online friends send martinis across the U.S.